Lately it seems like I’m constantly thinking of muffin flavors that I want to try. I was on the treadmill this morning and suddenly I’m all like, “I’ve gotta have banana split muffins this morning or I’m gonna die“. A little too dramatic? Yeah, I know ;). 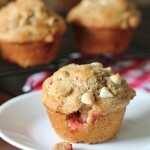 So as soon as I was done running, I rushed to my computer and googled “banana split muffin recipes”. Imagine my disappointment when I couldn’t find a single recipe that had chocolate, banana, strawberries, and pineapple. Um, hello, those are the flavors of a banana split. It seemed like the majority of the recipes had banana, chocolate, and cherries. While banana splits do have cherries on top, I don’t consider cherry to be a major player. But I wasn’t going to be deterred, I just made up my own recipe and they were every bit as good as I had hoped! They have all the flavors of a classic banana split but with only 170 calories and 5 grams of fat, so none of the guilt! 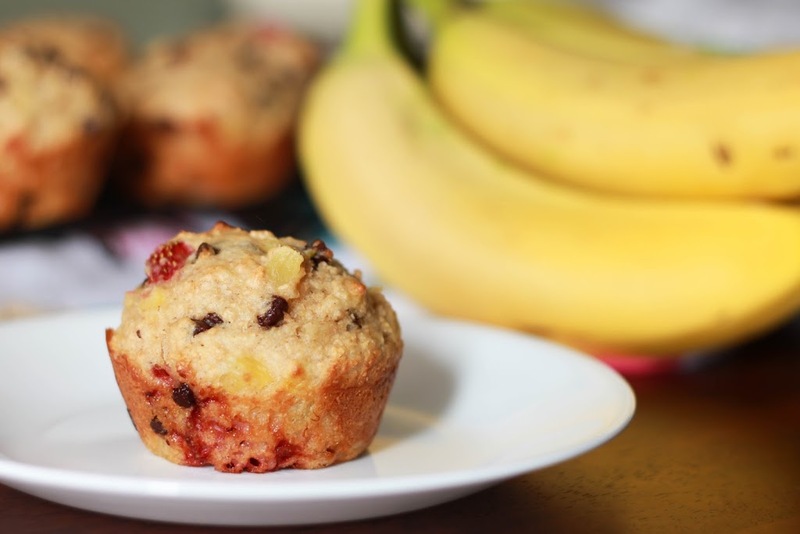 Make these muffins today. Promise? =) Enjoy! 1. Preheat oven to 400 degrees and spray 12 muffin cups with non-stick spray (or line with paper liners). 2. In medium bowl, whisk together brown sugar, oil, yogurt, buttermilk, egg, banana, pineapple, and vanilla. In separate bowl whisk together flour, baking powder, and salt. Add dry ingredients to wet and stir just until combined – do not over mix. Gently fold in strawberries and chocolate chips. 3. Divide batter among prepared muffin cups and bake for 17-20 minutes or until golden brown. 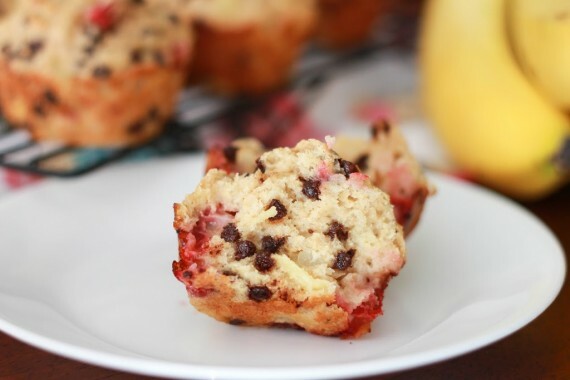 Note: A good portion of the fat and calories in these muffins come from the chocolate chips, so if you’re trying to cut calories you can reduce the chocolate chips to 1/2 cup or even less if you wanted. As you can see from the picture, 2/3 cup is a generous amount.